Ah yes - HDR. 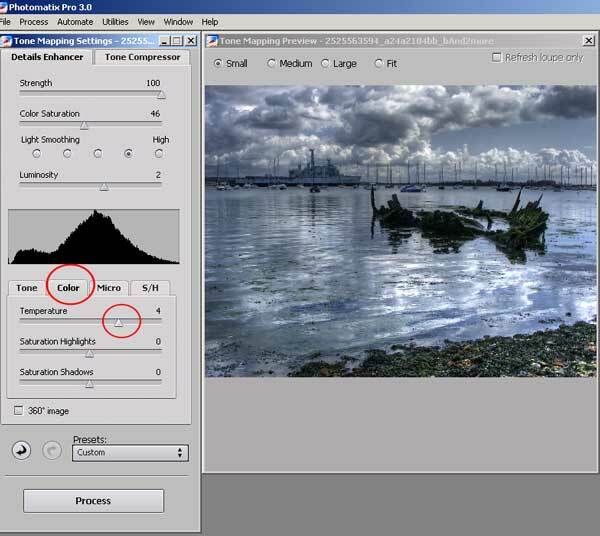 It's taking the photography world by storm, so here's a short tutorial showing you the basics about capturing the photos you'll need to make a HDR image. Then we'll be processing it in Photomatix to create something we can then work on in Photoshop, Elements, or any other editing software. What is HDR? Quite simply its a technique that allows you to create photographs where the details are retained in both the shadows and the highlights. 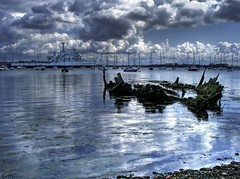 In this example I'm using Photomatix Pro by HDRsoft. 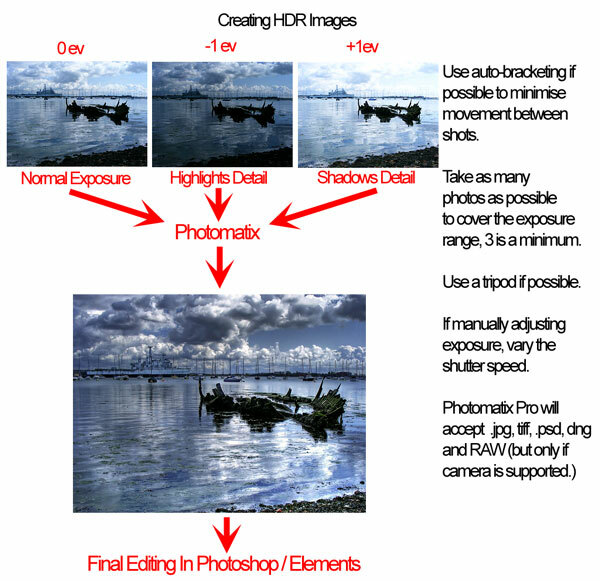 Here's a simple HDR work-flow - we need a number of differently exposed photos of the same scene. If your camera has auto-bracketing use that, it'll reduce the chance of movement between the shots. If you've got to do it manually, vary the shutter speed, not the aperture, so your Depth of Field (DOF) will not vary. It doesn't matter how many shots we take, but three is really the minimum. The maximum depends on the dynamic range of the scene - if there's very bright highlights and very dark shadows you may need up to ten. I usually only take three, I'm not that patient! RAW or .jpg? It depends if your cameras version of RAW is supported by Photomatix - check their website. 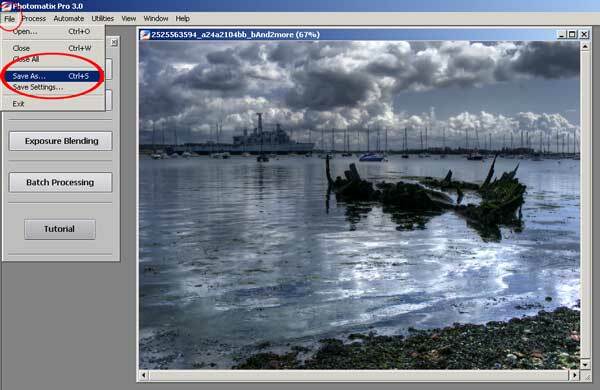 We then process our images using Photomatix, which produces a HDR image. This then has to be tone-mapped, again in Photomatix. 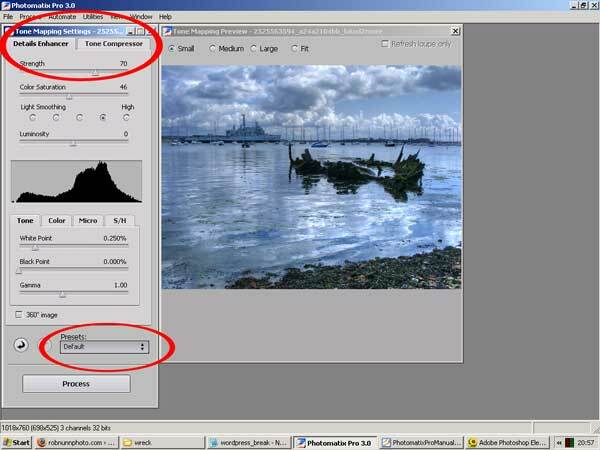 Finally we can save the image as a jpg or tiff and then edit it in Photoshop / Elements as any other photo. Choose a scene which has high dynamic range, and lots of detail. Landscapes on sunny days with plenty of clouds in the sky are always a good subject. 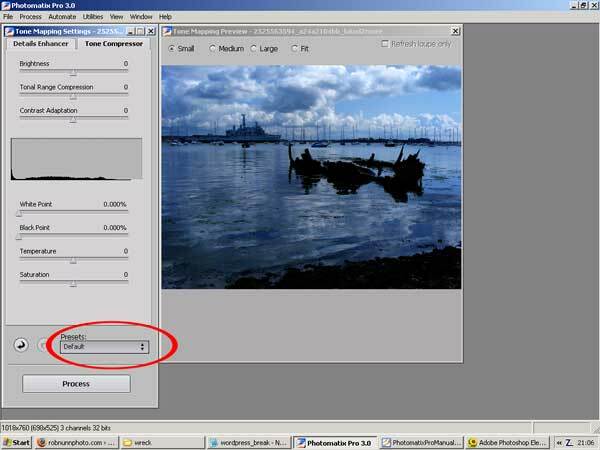 If Photomatix supports the RAW format for your camera (see above) you can choose to shoot in RAW, otherwise stick with .jpg. Set up your tripod and compose the scene in your viewfinder. 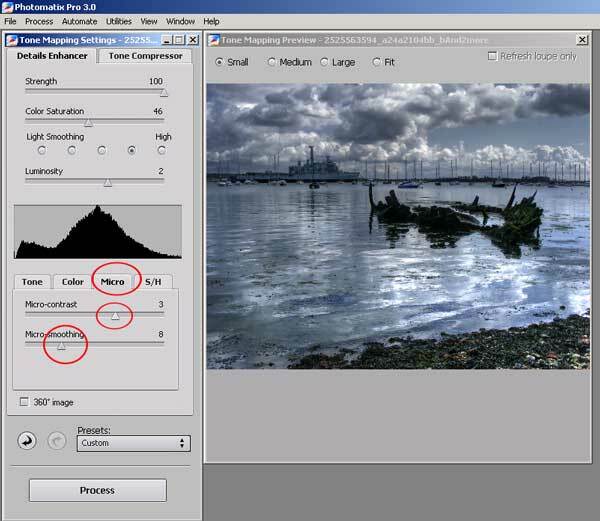 If you've got exposue auto-bracketing, go into aperture priority mode, then turn auto-bracketing on. Choose a small aperture (f6.8 upwards) to maximise your depth of field, so most of the scene is in focus. Use your shutter delay timer, and take the shots. Review them on your LCD screen to check composition and sharpness. Take another set anyway, just in case. 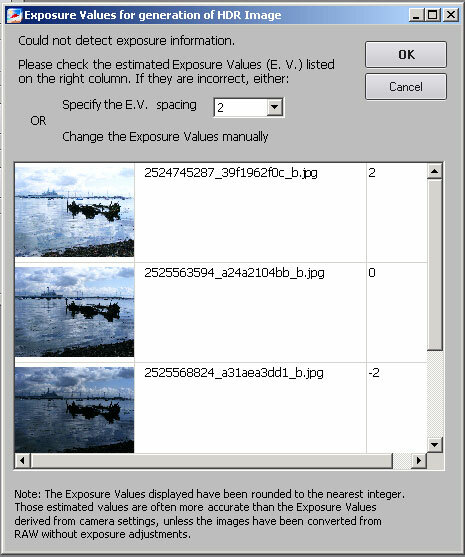 Don't worry about the automatic exposure interval too much, go for the maximum your camera will allow, whether that be + / - 0.5 ev, 1ev, 2ev, etc. Photomatix will sort all that out later. Some cameras will take 3 bracketed shots, some 5, some 9, the more the better - as you'll learn when you get used to the software. If you haven't got exposure auto-bracketing, go to manual mode. Take a meter reading, then set your ISO and aperture. Choose a small aperture to maximise depth of field. Use exposure compensation (check your manual) OR vary your shutter speed to get over-exposed, under-exposed, and a just-right exposure. Work quickly to avoid movements between shots, and use your shutter delay to minimise camera shake. All done? Lets go home, grab a cup of tea and fire up Photomatix! Just press OK, it always works for me! I've circled the settings I used, so they'll probably work well for you too. Press "OK". 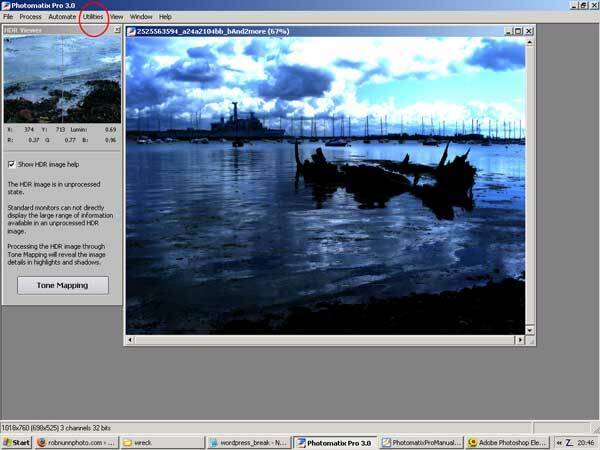 Photomatix will now combine our images, and you'll get to this screen, which looks a little odd. Don't Panic! This is a true HDR image, it's just that our monitors can't display it properly. If they could, it would be like looking out of a window into the actual scene, with bright sunlight and dark shadows. If you look near the top of the screen, you'll see the "utilities" menu, where you may want to rotate the image if necessary. If not, just press "Tone Mapping". Right, now we're in the main engine of Photomatix. We can work on our image in two main ways, the "Details Enhancer" or the "Tone Compressor". Details enhancer often gives the best results, but its always worth having a look at he Tone Compressor Tab as well. 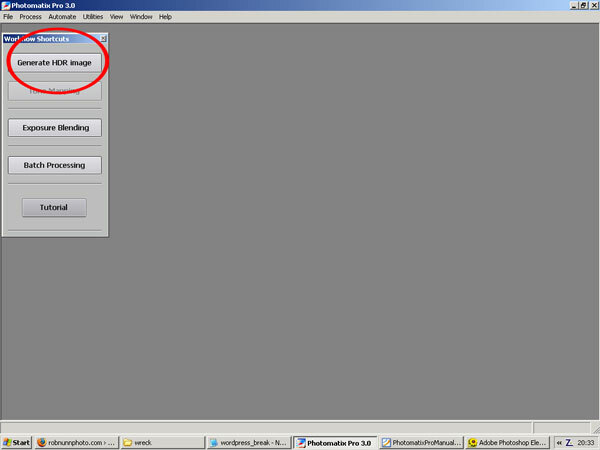 First though, check that the "Preset" drop-down box at the bottom of the screen is set to "default". 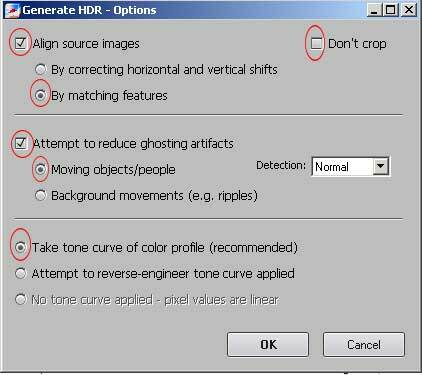 Make sure the Presets drop-down box is set to default, then have a play with the sliders. I don't use this method very often, but its always worth checking as sometimes it can produce pleasing, natural looking images almost straight away. Its not going to work on this image, so I'm going back to the "Details Enhancer", by clicking that tab at the top of the screen. I've circled the first settings I start to play around with. Strength. I like striking images, so I've put this up to 100. I've reduced the colour saturation slightly. Light smoothing is at medium-high. Drop it down if you want more of an "illustration" type shot. Luminosity controls the brightness of the shadows, so I've increased it slightly to bring out some detail in the wreck and the clouds. Gamma controls the overall brightness, and I've reduced it slightly to give the picture a gloomier feel. Now I'm going to click on the "color" tab. This shot looked a little too cold, or blue, so I've increased the Temperature to reduce that colour-cast. Now click on the "Micro" Tab. By sliding up the Micro Contrast setting, we increase the local contrast in certain areas, and in this case it makes the sky much more dramatic. I also increase the Micro Smoothing to lessen this effect a little. There's a lot more settings to play around with, but if you start off with those, you'll begin to understand how Photomatix works. Play around, move the sliders too far, then back again to check the changes. If the image starts to get too light or dark, go back to the "tone" tab and change the overall brightness with the "gamma" slider. Have fun! Once you're happy, hit the Process button near the bottom of the screen. You'll now get our true tone-mapped HDR, but its not finished. We need to save it in the highest possible setting, which is 16 bit TIFF. 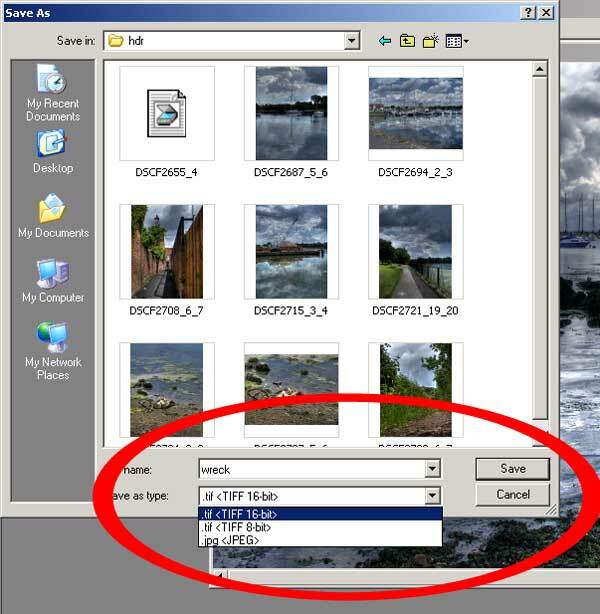 At the top of the screen, select "File" then "Save As", and in the resulting drop-down box make sure you select 16 bit TIFF. We've now got a file we can finish off with our normal editing process in Photoshop, Elements or any other Photo-Editing Suite. Note that Elements will convert the file to 8bits, and in Photoshop you'll probably have to convert in to "RGB 8 Bit" (under the image, mode, menu) to use certain filters and when you want to save the final image as a .jpg. I'm no HDR expert - check out Bert Monroys Pixel Perfect, Episode 92 and Episode 93, where Ben Wilmore shows how it should be done! Thanks to Peggy for inspiring this tutorial, Rob. Rob! This is fantastic and exactly, precisely what I needed! I suspect this is destined to become a popular source for new Photomatix users (and maybe those who never bothered to learn it in this depth) and will soon be a very popular link on many sites. Thanks! Glad you like it. Any more questions, just ask!